Way back in 2011, Louis Vuitton took the lid off of their in-house minute repeater movement, the first fruits from their acquisition of La Fabrique du Temps. It was an unexpected turn towards high-end watchmaking the likes of which we rarely see from a fashion brand. 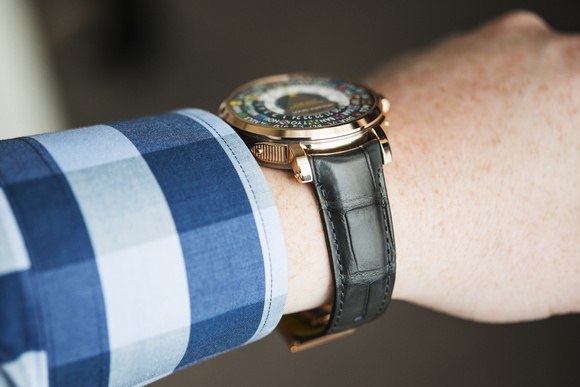 The movement was put to use within a Tambour case and we haven’t heard much of it since. 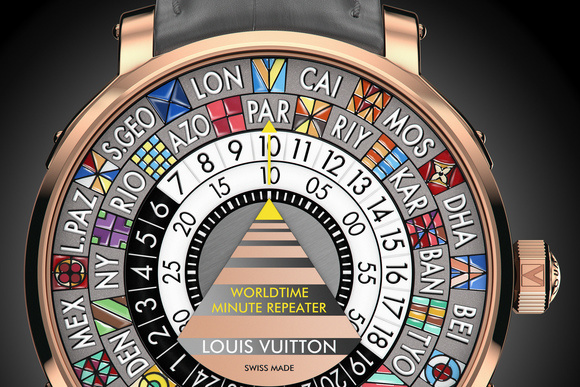 This year, however, LV put the movement inside their colorful Escale World Time watch, and coupled the repeating function to the time-zone function. 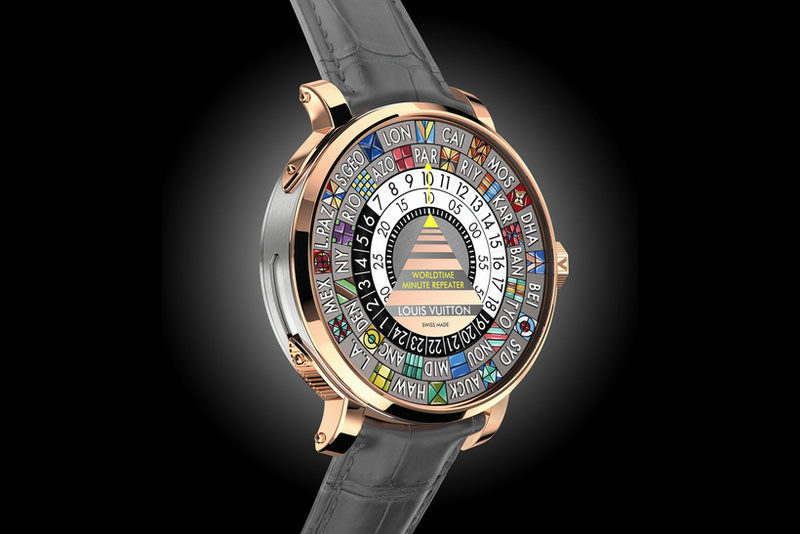 The Escale Worldtime was introduced last year, and drew our attention thanks to its hand-painted dial elements, and its unique presentation of the multiple time zones at once. The dial contains no less than 38 colors, requiring more than 40 hours from a craftsman to complete. It is a miniature oil painting, and its effect in person is impressively vibrant. Each pictograph represents a separate time zone, as labeled by the cities around the same ring. There face of the watch has three separate discs, which can be adjusted by a single crown. The outermost disc bears the colorful paintings and the initials of 24 cities around the world. Aligning the “V” on the crown with the case allows the “home” time to be set, which also locks in the time zone for which the minute repeater will chime. As a result, the time zone can be adjusted with the push of a button within the crown (moving your destination city to the top of the dial), and activating the minute repeater will give you the time in your “home” city. This also means that each time zone can be read at any given point with ease, thanks to the hour disc and the world-timer disc moving in sync with one another. The case itself is surprisingly wearable given its complexity. It measures 44 mm in diameter and just 11.7 mm in thickness. The middle of the case is comprised of titanium, while the bezel, horns, and crown are all 18K pink gold. Inside lives the LV235 caliber, developed and assembled at the La Fabrique du Temps Louis Vuitton Manufacture. 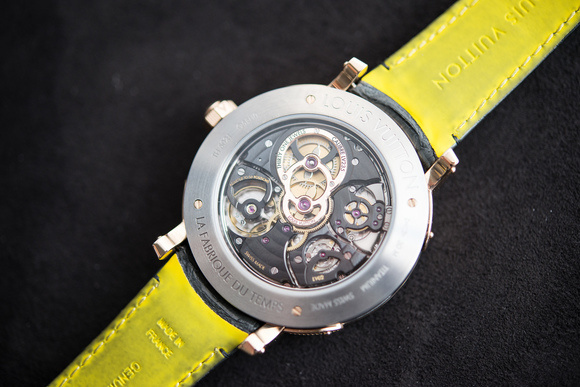 The movement is visible through the sapphire case back, which includes a clear view of the chiming hammers.